What is The Berkshire Carousel? The Berkshire Carousel is a not-for-profit, 501(c)3 venture that was designed to create an authentic classic wooden carousel that is both a work of art and a wonderful form of family fun and entertainment. 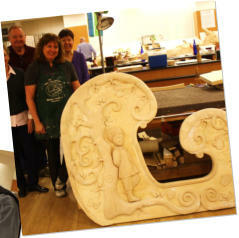 It is now a permanent display of the creative endeavors of The Berkshire County residents involved in it’s creation. Volunteers came into the project and learn how to build, carve, and sand wooden carousel horses that are essentially beautiful sculptures. Hundreds of hours go into creating each and every horse. It is the most ambitious and largest permanent artwork ever created in the Berkshires. The project has involved volunteers from all over Berkshire County who have built, carved, sanded, and painted the carousel ponies and created the artwork that is featured on the ride. 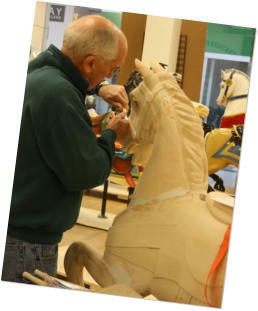 Participation in the project was accessible to all Berkshire County residents, whether through carving, sanding, or painting horses, developing exhibitions, donating resources, helping to operate the Carousel or volunteering to assist with enterprises and our educational programs. The project was designed to engender community pride and participation, and to offer an opportunity for all local residents to participate and create a community legacy. We have had hundreds of people volunteer for the project from Berkshire County and some from surrounding states as well. After beginning in July 2005, the development of the Carousel commenced in 2008 and was completed in 2015. Construction of the Carousel truly became a community effort. 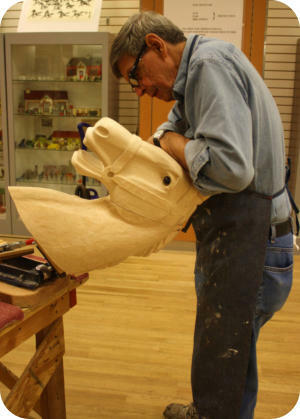 To create the numerous wooden horses, a resident professional carver mentored volunteers as they carved the carousel horses. The beauty and craftsmanship rival those of historic carousels. 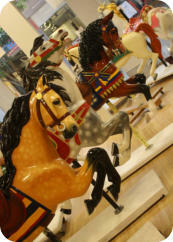 The figures are modeled after those of the most famous carvers of the Golden Age of Carousels from 1880 to 1930. Three chariots have been constructed, and Berkshire residents have completed the artwork for all of the Berkshire scenes themed rounding boards. Concurrent with the carving of the horses, the Carousel staff and board have been raising the necessary funds through an ongoing capital campaign. 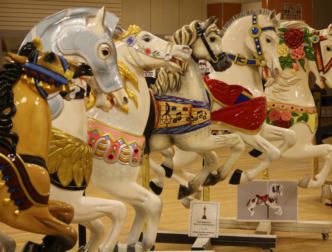 Carousels and Carvings, Inc of Marion, Ohio has finished refurbishing the 1928 Herschell carousel frame and mechanism. Since carousel frames are so robust, it is a common practice to rehabilitate old mechanisms to serve as the backbone for new carousel projects. The North Bay carousel is built on a Herschell frame of the same design and vintage. The Herschell Company of North Tonawanda, NY was a major carousel producer in the late 1800’s through the mid 1900’s and there was a Berkshire historical connection as well. Herschell was the manufacturer of the first carousel in the Berkshires; a steam driven carousel located in Berkshire Park on Route 8 in the early 1900s and also the manufacturer of the carousel at Pontoosuc Lake in the 1950s and 1960s. ( Also of note, the Herschell Company manufactured engines for the Berkshire Automobile and the Stilson Six, two autos built in the Berkshires in the early 1900s. ) The Berkshire Carousel’s machine is 40 feet in diameter with 14 sections, 33 horses, and three chariots (one handicapped accessible). We have also created spare horses for the Carousel. The Carousel construction costs include the refurbishing of the frame, shipment to Berkshire County, and a two week set up with a four-person crew. This portion of the project is fully paid for. The restored carousel frame and mechanism were transported and delivered to our workshop in Dalton on Friday, February 7, 2014. At this point our team of volunteers painted all pieces of our carousel mechanism. Creation of the horses. Additional to this cost is that of the creation of the horses, chariots, and panels that make up the body of the Carousel. For approximately four years the Berkshire Carousel contracted with a professional carver who mentored and supervised local volunteers in carving horses. During this time Berkshire County artists have been volunteers, trained and supervised other volunteers in the painting of all horses and other carousel parts. Since 2012, all carving and artwork has been totally done by volunteers under the supervision of a team of managers, all of whom are volunteers. The Berkshires themed rounding board paintings have been designed through a calling of all interested artists to submit paintings of local Berkshire County scenes of the 1900’s era. The Norman Rockwell Museum has also donated a copy of the famous Norman Rockwell painting of Main Street on Stockbridge, Mass. All of the peer carousels have developed a a unique approach (beyond rides, earned revenue, and contributed revenue) that fits the context of their community in order to be viable on a year-to-year basis and over time. Community support. The Berkshire Carousel has proven its ability to garner community support, evidenced in its corps of over 400 volunteers as well as commitment from a number of vendors and contractors who have and/or are willing to provide their services pro bono or at a greatly reduced cost. In addition, the Carousel workshop has been housed in donated spaces since its inception. Finally, the support for the feasibility research for this business plan was provided by a matching grant from the Massachusetts Cultural Facilities Fund (MCFF), a public program supported by the state of Massachusetts. Based on this plan and project success to date, MCFF has also awarded the Berkshire Carousel a $250,000 matching grant in 2013 for capital construction of the building to house the carousel. To date the carousel organization has raised $1.2 million. Berkshire Carousel requires at least 10,000 square feet for the carousel, exhibits, workshop, restoration shop, event space, office, gift shop, and concessions. Site development at the Pittsfield location will involve building the space to provide an attractive exterior and the interior of space for these and other planned functions. A task force including architects (Barry Architects, Inc) and various contractors (David J. Tierney, Jr., Inc. ) ( Maxymillian ) was formed and worked with the project for over five years to develop plans and costs for the freestanding building. This task force worked to raise funds for the construction. Final plans, the three phases, and cost estimates have been developed and worked on by this committee. An estimated million dollar structure can be built to house the Carousel and enable the Carousel to begin operations. We are now in the final stages and everyone has looked forward to seeing our carousel up and running in it’s new building in phase 1 of the construction plans. When we are finished people will be amazed how it all started, that Jim Shulman took it upon himself to prove that if you want to make something, if you put your mind to it you can accomplish your dreams and goals. 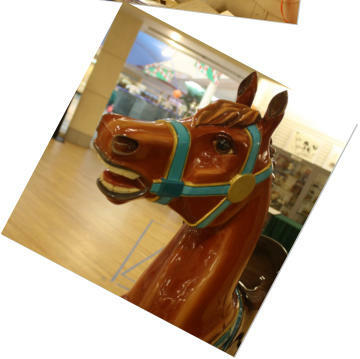 Jim started out by learning how to carve a carousel horse, and then he learned how to paint a carousel horse. If he could do it so could others. The horse Obie, has come to be known as the spirit and the symbol of our carousel since it is the premier horse to be completed. As always there are naysayers that said “This project was an impossible feat...” but alas the spirit of those who believe in it and do the work have triumphed. After hundreds of hours of carving, drawing, painting and sanding... we have finished phase 1 our carousel and look forward to working on phase 2 & 3. Now it is has happened and it is possible! So imagine a child waiting in line for a ride on a carousel, you just feel an overwhelming surge of anticipation and excitement! There are so many horses to choose from, which one will you choose? Then comes the moment when you get to choose which fearless stead to ride on your turn. You race other excited companions to climb onto the horse of your choice. Then the ride starts up and soon you fly through the air as you go up and down on the merry go round! It brings joy, magic, imagination and happiness into our lives. It brings us back in time to when things were simple.. this vision is coming our way so stay tuned for more progress and updates as we move forward to complete our carousel! The Berkshire carousel is the only carousel in the US that will have figures modeled directly from the classical ponies of the major carvers of all three styles. The primary changes in design from originals to make them unique is in the saddle and trappings or adornments around the saddle and bridle. The Berkshire Carousel We have completed the thirty nine horses, one donkey, a handicap accessible chariot, a rocking chariot, and a spinning tub. We have fourteen rounding boards, fourteen inner panel paintings, fourteen floral boards, and an inner core with more paintings and mirrors. This project has been a huge undertaking which has included hundreds of different people. Our Director Maria, who has worked in the arena of art and fund raising for over twenty five years, was recruited by Jim & Jackie in the early days of the project. Jim said to Maria “We are going to build a carousel together...” So after several years of hard work recruiting volunteers, recruiting sponsors, making horses, finding and moving the workshop from location to location, the project has finished phase one. She is in the midst of the capital fund raising campaign for phase two and phase three of the building. There is still plenty of work ahead to bring the carousel to life and Maria is up for the challenge. This project is a lifetime fulfillment of seeing how art can be a catalyst and make a community come together and create a legacy for all to benefit for years to come. What is The Berkshire Carousel? The Berkshire Carousel is a not-for-profit, 501(c)3 venture that was designed to create an authentic classic wooden carousel that is both a work of art and a wonderful form of family fun and entertainment. It is now a permanent display of the creative endeavors of The Berkshire County residents involved in it’s creation. Volunteers came into the project and learn how to build, carve, and sand wooden carousel horses that are essentially beautiful sculptures. 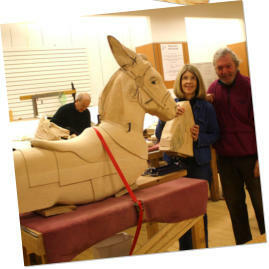 Hundreds of hours go into creating each and every horse. It is the most ambitious and largest permanent artwork ever created in the Berkshires. The project has involved volunteers from all over Berkshire County who have built, carved, sanded, and painted the carousel ponies and created the artwork that is featured on the ride. 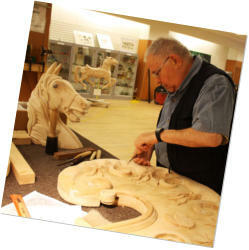 Participation in the project was accessible to all Berkshire County residents, whether through carving, sanding, or painting horses, developing exhibitions, donating resources, helping to operate the Carousel or volunteering to assist with enterprises and our educational programs. The project was designed to engender community pride and participation, and to offer an opportunity for all local residents to participate and create a community legacy. We have had hundreds of people volunteer for the project from Berkshire County and some from surrounding states as well. After beginning in July 2005, the development of the Carousel commenced in 2008 and was completed in 2015. Construction of the Carousel truly became a community effort. 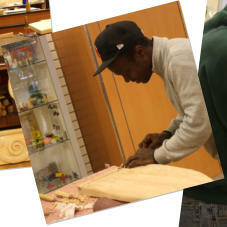 To create the numerous wooden horses, a resident professional carver mentored volunteers as they carved the carousel horses. The beauty and craftsmanship rival those of historic carousels. The figures are modeled after those of the most famous carvers of the Golden Age of Carousels from 1880 to 1930. Three chariots have been constructed, and Berkshire residents have completed the artwork for all of the Berkshire scenes themed rounding boards. Concurrent with the carving of the horses, the Carousel staff and board have been raising the necessary funds through an ongoing capital campaign. 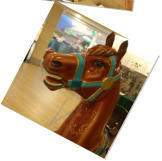 Carousels and Carvings, Inc of Marion, Ohio has finished refurbishing the 1928 Herschell carousel frame and mechanism. Since carousel frames are so robust, it is a common practice to rehabilitate old mechanisms to serve as the backbone for new carousel projects. The North Bay carousel is built on a Herschell frame of the same design and vintage. The Herschell Company of North Tonawanda, NY was a major carousel producer in the late 1800’s through the mid 1900’s and there was a Berkshire historical connection as well. Herschell was the manufacturer of the first carousel in the Berkshires; a steam driven carousel located in Berkshire Park on Route 8 in the early 1900s and also the manufacturer of the carousel at Pontoosuc Lake in the 1950s and 1960s. ( Also of note, the Herschell Company manufactured engines for the Berkshire Automobile and the Stilson Six, two autos built in the Berkshires in the early 1900s. ) The Berkshire Carousel’s machine is 40 feet in diameter with 14 sections, 33 horses, and three chariots (one handicapped accessible). We have also created spare horses for the Carousel. The Carousel construction costs include the refurbishing of the frame, shipment to Berkshire County, and a two week set up with a four- person crew. This portion of the project is fully paid for. The restored carousel frame and mechanism were transported and delivered to our workshop in Dalton on Friday, February 7, 2014. At this point our team of volunteers painted all pieces of our carousel mechanism. Creation of the horses. Additional to this cost is that of the creation of the horses, chariots, and panels that make up the body of the Carousel. For approximately four years the Berkshire Carousel contracted with a professional carver who mentored and supervised local volunteers in carving horses. During this time Berkshire County artists have been volunteers, trained and supervised other volunteers in the painting of all horses and other carousel parts. Since 2012, all carving and artwork has been totally done by volunteers under the supervision of a team of managers, all of whom are volunteers. The Berkshires themed rounding board paintings have been designed through a calling of all interested artists to submit paintings of local Berkshire County scenes of the 1900’s era. The Norman Rockwell Museum has also donated a copy of the famous Norman Rockwell painting of Main Street on Stockbridge, Mass. All of the peer carousels have developed a a unique approach (beyond rides, earned revenue, and contributed revenue) that fits the context of their community in order to be viable on a year-to-year basis and over time. Community support. The Berkshire Carousel has proven its ability to garner community support, evidenced in its corps of over 400 volunteers as well as commitment from a number of vendors and contractors who have and/or are willing to provide their services pro bono or at a greatly reduced cost. In addition, the Carousel workshop has been housed in donated spaces since its inception. Finally, the support for the feasibility research for this business plan was provided by a matching grant from the Massachusetts Cultural Facilities Fund (MCFF), a public program supported by the state of Massachusetts. Based on this plan and project success to date, MCFF has also awarded the Berkshire Carousel a $250,000 matching grant in 2013 for capital construction of the building to house the carousel. To date the carousel organization has raised $1.2 million. Berkshire Carousel requires at least 10,000 square feet for the carousel, exhibits, workshop, restoration shop, event space, office, gift shop, and concessions. Site development at the Pittsfield location will involve building the space to provide an attractive exterior and the interior of space for these and other planned functions. A task force including architects (Barry Architects, Inc) and various contractors (David J. Tierney, Jr., Inc. ) ( Maxymillian ) was formed and worked with the project for over five years to develop plans and costs for the freestanding building. This task force worked to raise funds for the construction. Final plans, the three phases, and cost estimates have been developed and worked on by this committee. An estimated million dollar structure can be built to house the Carousel and enable the Carousel to begin operations. We are now in the final stages and everyone has looked forward to seeing our carousel up and running in it’s new building in phase 1 of the construction plans. When we are finished people will be amazed how it all started, that Jim Shulman took it upon himself to prove that if you want to make something, if you put your mind to it you can accomplish your dreams and goals. 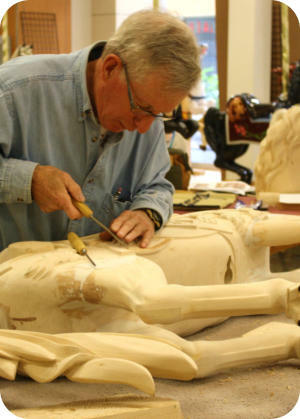 Jim started out by learning how to carve a carousel horse, and then he learned how to paint a carousel horse. If he could do it so could others. The horse Obie, has come to be known as the spirit and the symbol of our carousel since it is the premier horse to be completed. As always there are naysayers that said “This project was an impossible feat...” but alas the spirit of those who believe in it and do the work have triumphed. After hundreds of hours of carving, drawing, painting and sanding... we have finished phase 1 our carousel and look forward to working on phase 2 & 3. Now it is has happened and it is possible! So imagine a child waiting in line for a ride on a carousel, you just feel an overwhelming surge of anticipation and excitement! There are so many horses to choose from, which one will you choose? Then comes the moment when you get to choose which fearless stead to ride on your turn. You race other excited companions to climb onto the horse of your choice. Then the ride starts up and soon you fly through the air as you go up and down on the merry go round! It brings joy, magic, imagination and happiness into our lives. It brings us back in time to when things were simple.. this vision is coming our way so stay tuned for more progress and updates as we move forward to complete our carousel! The Berkshire carousel is the only carousel in the US that will have figures modeled directly from the classical ponies of the major carvers of all three styles. The primary changes in design from originals to make them unique is in the saddle and trappings or adornments around the saddle and bridle.